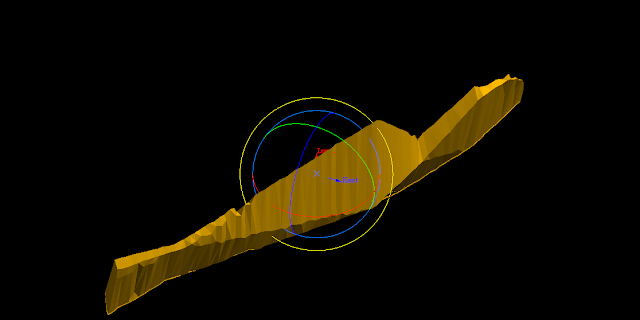 In Maptek Vulcan, one of the most used functions is the 3D rotation tool. Rotating a Vulcan design is a fundamental attribute of all data in 3D. Because of its fundamental nature, the rotate tool is often overlooked when introducing someone to the software. The very fact that ‘everyone’ knows how to use the rotate tool causes users and trainers to neglect telling ‘everyone’ about how to use it. As a direct result of this, ‘everyone’ does not know how to use the tool effectively. I have received several comments recently about people having trouble using the rotate tool in Maptek Vulcan version 8.2. I have been using version 8.2 for a while now and haven’t had any problems with the rotate tool (other problems aside, the rotate tool seems to work as expected). I am using Windows 7 operating system for 64 bit systems. My computer is a Lenovo Think Pad. I suspect that the issues people are seeing with their rotate function in version 8.2 are user related. In order to rule out user error as a possibility for the rotate issues I have written the following tutorial about selecting the center of rotation. I believe that this is the most likely explanation of the problems people have been having with their data ‘flying’ off the screen when using the rotate tool. If you are still having troubles with the rotate function after implementing these steps please let me know. The ‘Rotate Mode’ icon is located directly below the ‘Select Rotation Centre’ icon and will prompt you to select a center of rotation just like the ‘Select Rotation Centre’ icon if there is no rotation center already specified. Once you have selected the ‘Select Rotation Centre’ icon you will be prompted to ‘Select centre of rotation.’ You will also notice that your cursor has two little symbols associated below it. The symbol on the left is a 3D Cartesian Coordinate System indicating that you are in ‘Select Rotation Centre’ mode. On the right is a cross hair indicating that you are in ‘Snap to Objects’ mode. One of the biggest problems new users have with the rotate mode is selecting a center of rotation that is not touching any data loaded on the screen. 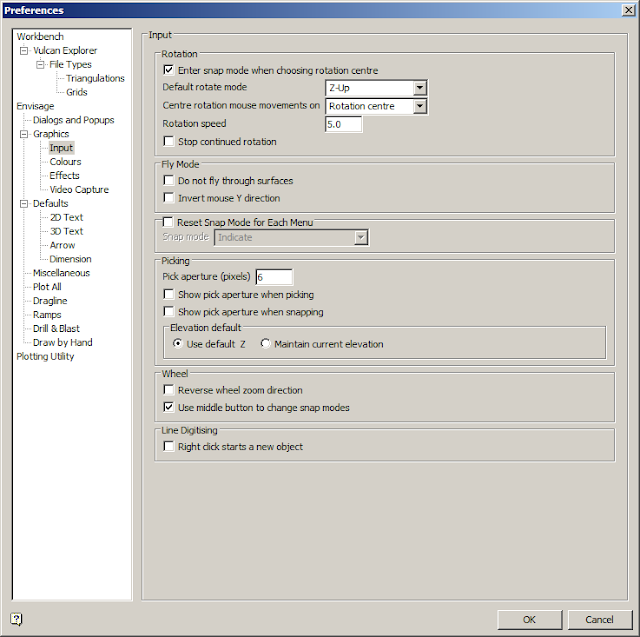 By default, Maptek Vulcan enters the user into the ‘Snap to Objects’ mode when selecting a rotation center. New users may not recognize this mode and attempt to click in blank space. Vulcan will not allow clicking in blank space while in a snap mode. In order to click in blank space the user must select the ‘Indicate’ cursor mode. This mode will allow the user to click in blank space but now the elevation of the rotation center becomes an issue. If the center of rotation is not snapped to the objects that you wish to look at while rotating Vulcan can behave in an unexpected manner. For instance, let’s assume that your design data is at 1,000 ft elevation and your default Vulcan elevation is 0 ft. In this case the data you want to look at is at the end of a 1,000 ft radius leading out from the rotation center. This scenario will cause the data to ‘fly’ off the screen. To avoid having your data ‘fly’ off the screen ensure that the Vulcan defaults have not been changed. Go to the menu: Tools > Preferences > Envisage > Graphics > Input and ensure that the box ‘Enter snap mode when choosing rotation centre’ is checked. Always snap to an object when rotating unless you have deliberately specified the z elevation.